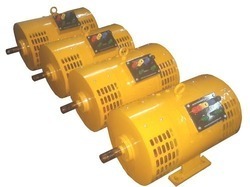 Offering you a complete choice of products which include single phase ac alternator. A single phase alternator / Auxiliary Alternator is a generator that produces a single, continuously alternating voltage. These are usually used in smaller systems and produce ac power at utilization voltage. ... A single phase alternator is a generator that produces a single, continuously alternating voltage.